Sotrender is happy to present the 10th edition of Fanpage Trends UK – the first report analysing brand communication on Facebook in the UK. We analysed reach, engagement, customer service, and content on Facebook in 11 integral industries. What are the biggest UK Facebook Pages? Which of them is the most successful at engaging fans and followers? Read the report and broaden your perspective on the social media landscape in the United Kingdom. The report contains data for 11 different industries present on Facebook in the UK. These are: All UK Brands, Alcohol, Banks, IT/Electronics, Beverages, Beer, Politics, Retail, Cars, Sweets, and Telecommunication. 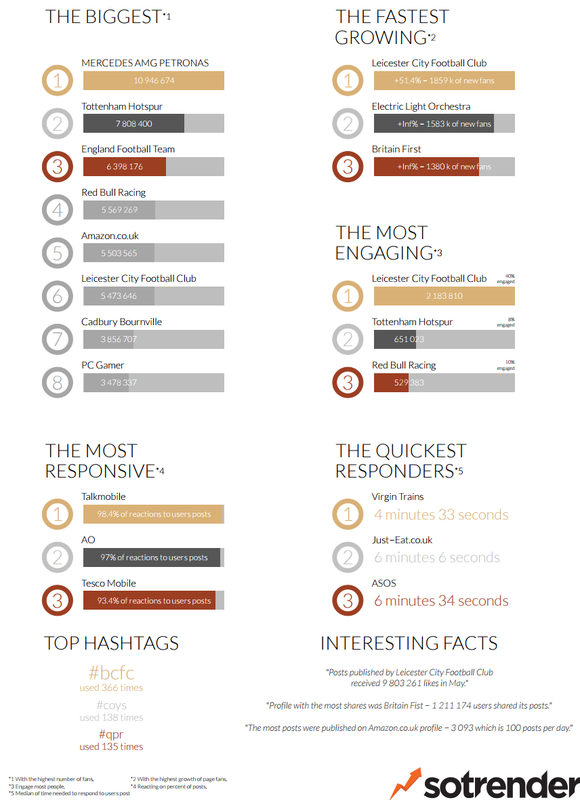 May’s top performing post was made by Leicester City Football Club, who have been on a role as of late in both the football and social media fields. 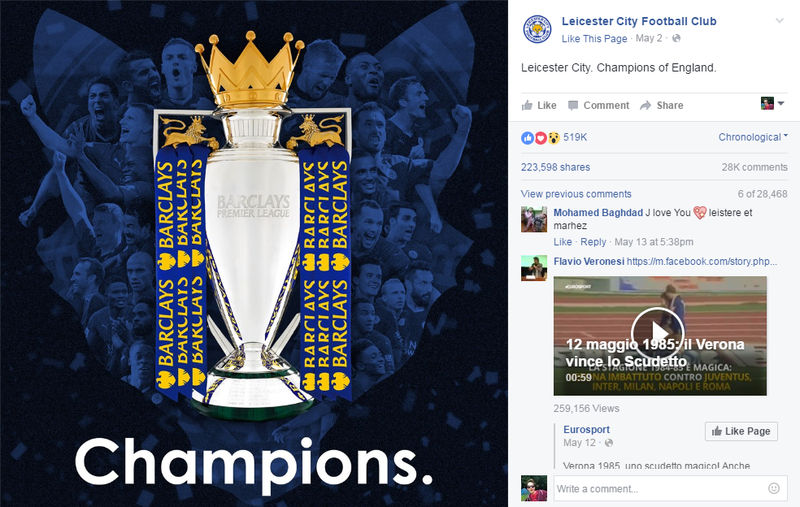 After winning a victory in the Premier League, they made a photo post announcing themselves as the “Champions of England” garnered them a massive amount of interactions, more than 4 times that of the running up post. That post was made by Jeremy Corbyn, who received a ton of engagement once again my attacking David Cameron and the actions of the Tories. The following top posts were made by England Football Team about EURO 2016, Tottenham Hotspur, who humbly congratulated Leicester for their victory, and Deus Ex, who posted a captivating trailer for their upcoming video game. 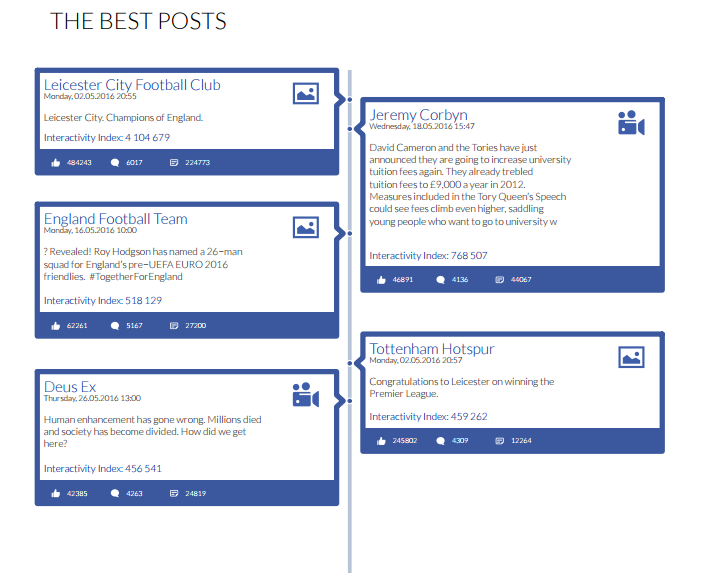 Unsurprisingly, the most engaging page was Leicester City Football Club. On top of having the most engaging post this month, they’ve maintained a steady level of engaging posts through out the month (2.1 m users engaged). Trailing behind in second was Tottenham Hotspur (651 k engaged), followed by Red Bull Racing (529 k engaged), both of which keep hovering at the top of the rankings for the past few months. Sports are, yet again, the prevailing Facebook pages in the UK. I'm the founder and CEO of Sotrender, a rapidly growing social media analytics company. At heart, I'm an analyst and researcher. I'm also a frequent speaker and university lecturer with a Ph.D. in social psychology focusing on online communities.